When it comes to our favorite music we cannot compromise on the quality. We want the best quality sound system whether we are using speakers or headphones to assure that we enjoy the quality of sound. However, people are picky when it comes to headphones because they want to have the best. There is a huge variety of products available in the market that makes a selection of the best one confusing. Today we have for you the complete review of Mpow 059 Bluetooth Headphones Over Ear (affiliate link). Mpow 059 Bluetooth Headphones Over ear is rapidly gaining the attention of the customers because of its sleek design and amazing specifications. The headphones are setting the standards high in the market by providing the best features and sound quality at an affordable rate. The packages include a USB charging cable, audio cable, black carrying pouch and a user manual. It means that you will not have to invest in extra accessories while using the product. It is manufactured with high-quality plastic to make it more durable and long-lasting. The glossy appearance of headphones is not loved by everyone. Mpow 059 Bluetooth Headphones (affiliate link) has some of the best features that will allow you to enjoy listening to the music. It comes with both wireless and wired technology to assure that even if you forgot to charge your headphones, you can still enjoy tor music. Here are some of the interesting features you will find while using the product. A common feature that is sacrificed in most headphones is the comfort. That is why if you will listen to the music for a long time your ears will start to hurt. However, in the manufacturing of Mpow 059 Bluetooth Headphones, special attention is given to the comfort level of the headphones. The ear pads have been manufactured with a soft material that will not cause any kind of a pain in your ear muscles. Your ear will easily adjust to the headphone. It comes with a breathable technology, which means your ear will not sweat while using the headphones. The biggest attraction of the headphones is that it has easy control features. All the buttons and control system of the headphone is installed on the outer side of the headphones. All you need to do is learn to access the control with your hand without removing the headphones from your ear. 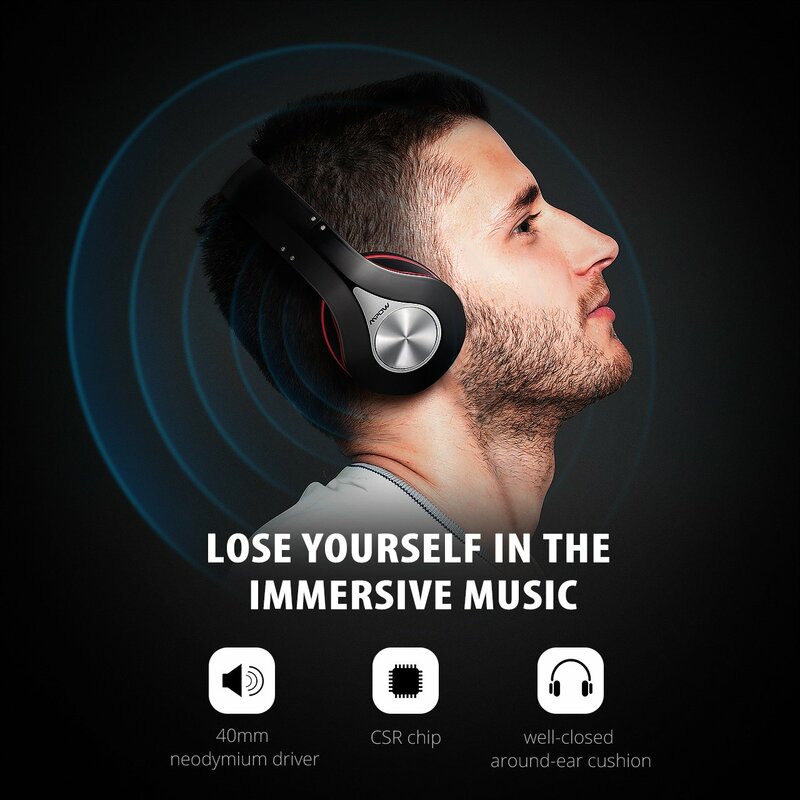 It will allow you to enjoy your music without any kind of disturbance. There are no confusing settings in the headphones that will make it hard for you to access the features. There is a hang-up button included in headphones that will allow you to attend your calls as well. An important factor to consider while selecting the headphone is the sound quality. No doubt there are tons of other features in the product but when it comes to sound you will get a properly balanced effect. The bass of sound is amazing but it might seem a little boomy in the beginning. It has a great sound quality that is properly focused on the lower ends. As well as you will get a chance to adjust the mids and highs. This is the reason we said that it is all about balancing the sound effects of headphones. The headphones have a passive noise cancellation technology. Some of you might consider it as a drawback of the product but if you will pay closer attention you will notice that passive sound cancellation is better as compared to active sound cancellation. It depends on how the earplugs will fit your phone. As well as the sound produced by noisy vehicles will not be canceled that will save you while you are driving and crossing the road. Complete noise cancellation can lead to accidents in such situations. Passive noise cancellation is also a plus point when you are using the headphones in the office because you will not be completely distracted. An important feature that you cannot ignore while you are using the Mpow 059 Bluetooth Headphones is the battery life of the product. It is one of the few headphones available in the market that comes with the longest battery timing of 24 hours. It means that you can enjoy listening to music the entire day without any disturbance. However, battery timing of the headphones also depends on how loud you listen to music. A little drawback is that it has a longer charging time. It commonly takes 4.5 hours to charge which means that it is not the fastest charging headphones available in the market. A reliable feature of the product is that it comes with dual technology. 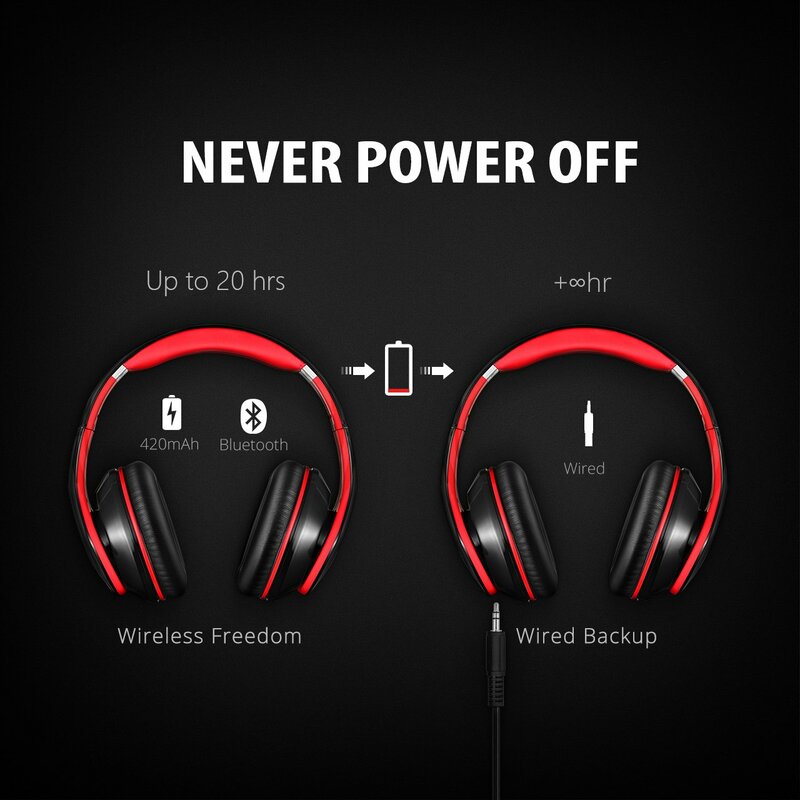 If you are not planning to use the headphones with the wire you can always connect it using the Bluetooth technology. It is compatible with all devices that will give you peace of mind that you are using a quality product. However, there is a wire included in the headphone to assure that in case you forgot to charge your headphones you will always have a wire by your side to connect them with your device and enjoy the music. 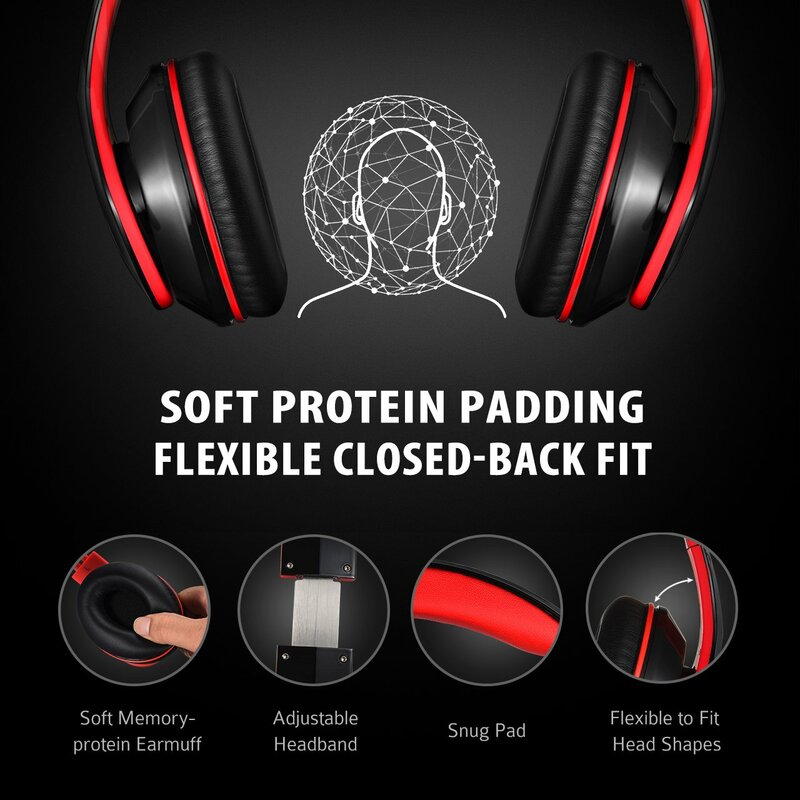 Some of the amazing benefits you will get by using the Mpow 059 Bluetooth Headphones (affiliate link) are. A few drawbacks you need to consider before selecting the product are. Mpow 059 Bluetooth Headphones (affiliate link) is a reliable and affordable product that will allow you to enjoy your music in the best possible way. It is comfortable and you will surely enjoy the sound quality that you will get. It has a great value for money because at an affordable rate you will get access to so many features.